BMW launched one of the most awaited bikes of 2018 last month – the 313-cc G 310 R (naked) and the G 310 GS (adventure) models. Priced at Rs 2.99 lakh for the R and the Rs. 3.49 lakh for the GS version, the launch of these bikes mark BMW’s foray into the world of entry-level performance motorcycles. And while they do wear the BMW logo, the bikes do seem expensive on paper. We rode them extensively to see if they are worth your hard-earned money or not. Here is our video review – hit that Play button! Both the bikes are made at TVS Motors’ Hosur manufacturing facility near Bengaluru and make use of the same 313-cc engine that powers the Apache RR310. However, these bikes are a lot different as we found out during our day-long riding stint. Let’s talk quickly about the GS first – this bike enjoys dominance in the segment by default. Why? 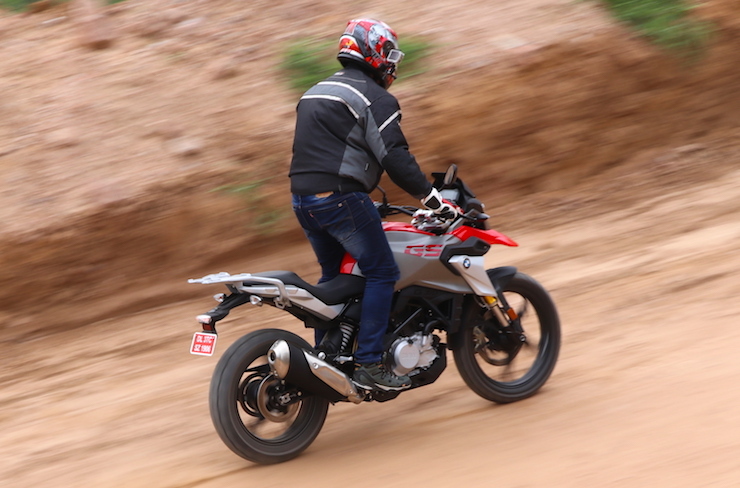 Well, the Royal Enfield Himalayan is under-powered, half as reliable and feature stripped – no ABS, no tubeless tyres, no multi-info display and so on. And the Kawasaki Versys 300 is simply too expensive. Thus, even at Rs. 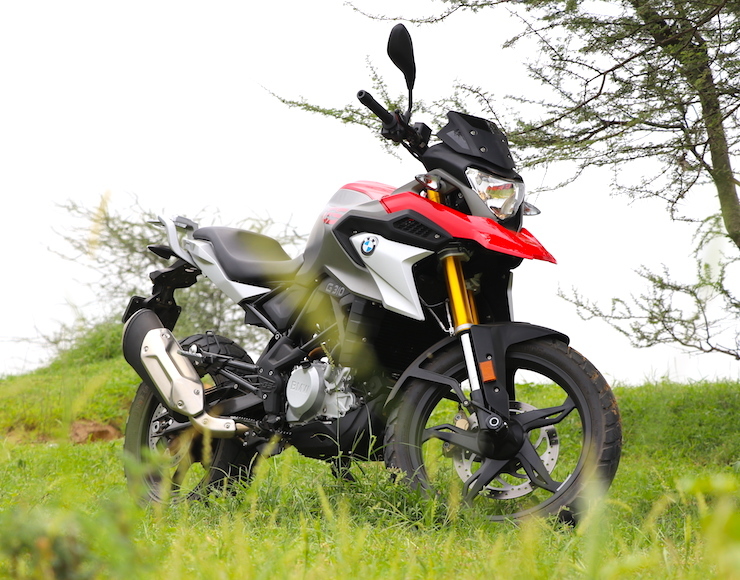 3.49 lakh, the R 310 GS makes for a great purchase and could be your ticket into the world of adventure motorcycles. I was floored by its suspension travel, comfortable ergonomics and the rev-happy motor that allows the rider to explore the unknown at his (or her) own pace. 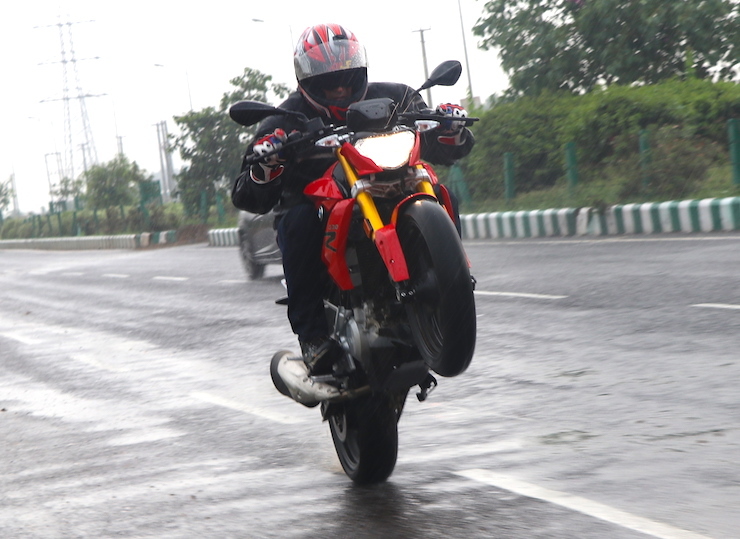 We had a huge trail to our disposal, in Gurgaon, which proved to be a perfect place to tame the GS. For starters, it feels like a much bigger (capacity) motorcycle. Standing on the pegs (metal finish, not rubber) with my knees bent slightly, the GS chewed up miles fast and easy and the 180 mm of suspension travel at either ends made sure all bumps and jumps were taken care of. Out on the highway, the GS proved its mettle too. Throttle pinned, it does 58 in 1st, 83 in 2nd and 105 in 3rd. Touring junkies will be happy to know that the GS does about 85 km/h in 6th at 5000 rpm, while sipping fuel at the rate of 33-35 kmpl. A while later, it was time to get astride the cheaper and lighter R which is in a different league altogether. It’s 11 kilos lighter, has a 50-mm lower ride height, rear set foot pegs and smaller tyres. 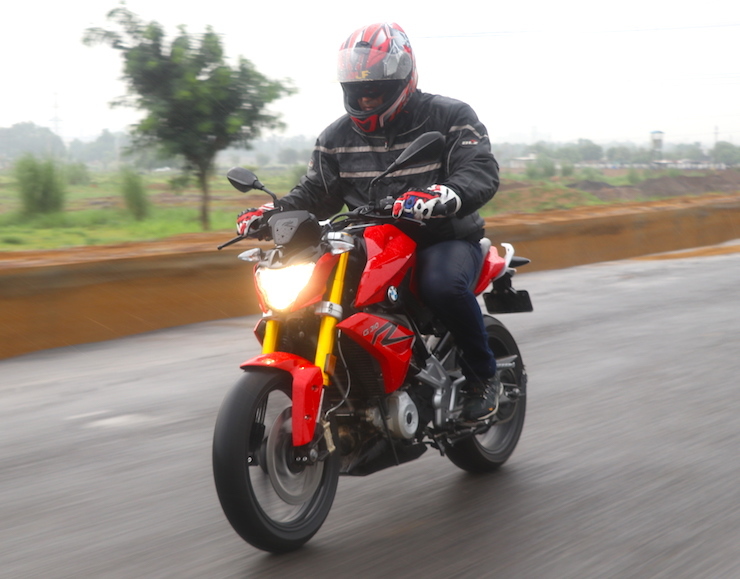 The last aspect is what, in turn, makes for shorter gearing, which makes the G 310 R a hoot to ride in city traffic. Don’t get me wrong here, the GS is a great tool too, but the R makes you a hooligan and begs you to explore the entire rev range of the engine. Shorter gearing means in-gear acceleration is way better, but at the cost of lower speeds in each gear. Also, the engine on the R and GS felt a tad smoother compared to the Apache RR310 and this is a welcome move. The R, with its aggressive seating posture, feels at home while zipping through traffic. We did have our share of rain during the shoot and this is where I did miss a slipper clutch on both the bikes. While ABS is standard (switchable on the GS), a slipper clutch simply adds to the peace-of-mind factor while having your own share of fun with the bikes. The R’s suspension travel is also less and the set-up feels a tad on the firmer side, just what you need for attacking corners. I think BMW has achieved the perfect balance between ride and handling on the naked 310 version. BMW is offering great financial deals on the bikes too, with finance of up to 100% of the ex-showroom price for up to 5 years. And let’s not forget the standard 3-year warranty, which can be extended to 5 years. These two aspects will go a long way in attracting buyers to BMW Motorrad showrooms across India – but this also gets us to a potential problem. The current network is wafer-thin, which means potential buyers in smaller towns will be disappointed. That aside, if you do overlook the initial high sticker price, these new 310 models are worth the wait. Do watch the video above!